Emmanuel Petit is looking for the Man United midfielder to do whatever it takes to play up to his true potential in Russia. 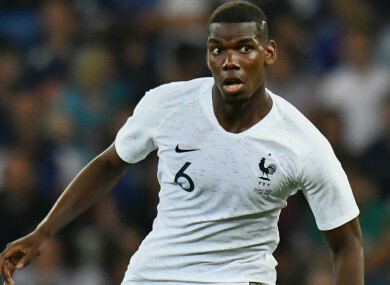 PAUL POGBA HAS been urged to get angry while on World Cup duty with France, with Emmanuel Petit considering the Manchester United midfielder to be at his best when playing with passion. Critics have accused the player of having yet to fulfill his potential, following his €101 million signing in 2016. Petit said he has seen glimpses of his true ability, however, and believes that Pogba performs at his peak when frustrated and trying to prove a point. The 1998 World Cup winner is looking for more of that in Russia this summer, saying: “We all know Pogba has great potential but I want to see the same Pogba I saw against Manchester City when United won 3-2. “I want to see that Pogba, with the mindset that he is against the world, when he has no option but to show to the rest of the world that he has the potential to be one of the best in his position. “He thrives on anger sometimes and I want that Pogba. I wish we could have Pogba like this every game. Petit, who won the World Cup on home soil alongside current France boss Didier Deschamps, added: “Something I have been saying for ages is that Didier has a luxury that former managers didn’t have in terms of options. “He can make two national teams with the same level, no problems at all. “So stability could be something very important to help the players in terms of confidence. He has to stick with his decisions even if some players offer big criticism. France, who are among the favourites to go all the way in Russia, will open their World Cup 2018 campaign against Australia on 16 June. Email “'Pogba performs best when he's angry': ex-World Cup winner wants passion from France star”. Feedback on “'Pogba performs best when he's angry': ex-World Cup winner wants passion from France star”.